Yesterday was Australia Day (the Holiday), as opposed Australia Day (the Day) which observant readers will by now have realised was last Saturday, and we celebrated it by having a goodly portion of a few hundred people over and sailing all manner of boats, and of course launching Phil and Chris' lovely Eureka Canoe. We had sort of planned to launch ours too, but well there are one or two little details still to complete, so that remains as a good excuse for yet another party at the home of the Biting Midge at some yet to be determined future date. Australia Day did mark the fourteenth anniversary of the launching of our Goat Island Skiff, Gruff, and we took her for a burn round the block but it's fair to pay a bit of homage to the dear old thing. Since this story has been on my Goat Island Skiff pages for about ten years, I'll repeat it here for posterity without fear of reprisal from the cast. 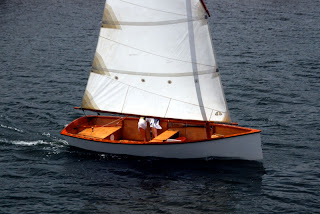 Gruff was very new, and yes I was quite pleased with the way it turned out, it being my first solo boat building attempt and everything, and in the process I'd managed to achieve a small amount of notoriety by having my construction diary published in Australian Amateur Boatbuilder. AABB is not renowned for being terribly fussy about its editorial content, but I took that one as a goal to me anyway and felt suitably famous. It was all glistening and woody and had shiny new sails and let's face it, I was chuffed. I think we all were to greater or lesser degrees. Abbie was 16 and we were holidaying on the Noosa River at Noosaville. Fiona was staying with us, and by stretching the already overstretched mathematical bit in my brain, I have calculated that her age was very similar to Abbie's at the time. One fine sunny afternoon, the girls asked me to help them rig the boat and of course I gladly obliged, anything to encourage healthy outdoor pursuits, particularly those that reflect my own interests. How successful was I as a parent and role model? My children were becoming boat people, perhaps I could get them to crew when we raced! My heart almost skipped a beat at the thought. "Oh we're not going sailing dad, we're just going to sit beside it on the river bank." "All the guys keep coming up and asking us questions about it." Thanks for a great day! - "The whole team played extremely well"
Thanks for making a great day! I'm sorry we couldn't make it a week long event. Maybe next year! How come little E is spelt with a big e?